Netgear’s Orbi Mesh Wi-Fi system is arguably the best Mesh Wi-Fi system on the market to date. They have continued to improve it over the years and have introduced multiple systems to meet different price points. I personally use the Orbi RBK23 system and can vouch for how good it is. data rate but also dramatically increases the throughput of the system by four fold. In laymans terms, it can handle more data and faster. If you have a Wi-Fi 6 (802.11ax) capable device this means that you will theoretically be able to achieve gigabit transfer speeds over the network. Wi-Fi 6 has been very slow to roll out and only a handful of products were released supporting it last year. Several vendors have announced products using it at CES this year, so expect to see it become much more popular. To make the most of it though you will need a compatible Wi-Fi chip in your device, I don’t think any mobiles to date have this ability. A quick search on Google shows absolutely no dongles or other devices to make use of it. So at the moment gigabit transmission speeds between devices isunlikly. However the new Orbi will still nebefit from the 4×4 Wi-Fi 6 backhaul. Performance of the Orbi Mesh Wi-Fi Systems is improved by adding 1024 QAM with a 4×4 Wi-Fi 6 backhaul, increasing the speeds, coverage and capacity of this dedicated wireless link between the Orbi router and satellites. the next generation of mobile and smart home devices. This next generation Orbi Wi-Fi system is ideal for households with a multitude of connected devices running high-bandwidth internet for HD/4K video streaming, always-on smart home devices and video monitoring security systems, which stream HD/4K to mobile devices. With an Orbi Mesh Wi-Fi system using Wi-Fi 6, your network will now be ready to effortlessly support these ultra-high-speed bandwidth-hungry applications, as well as others such as interactive VR games, 4K live sports broadcasts while also continuing to support all legacy Wi-Fi devices. 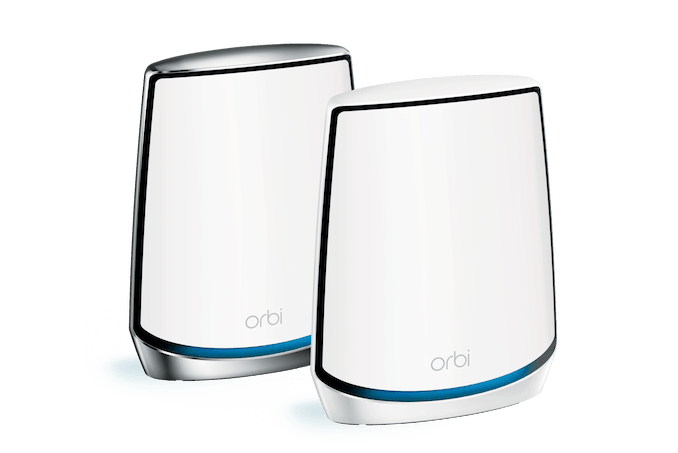 Pricing for the Orbi kits with Wi-Fi 6 was not announced, as the products are slated to become available only in H2 2019 in the form of new Orbi RBK50 systems.